2011 MLB Postseason: Can A.J. Burnett Be a Hero and Keep the Yankees Alive? 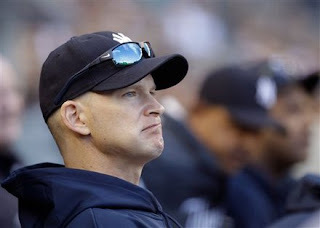 The New York Yankees' season rests of the shoulders of one Allan James Burnett as he will start game 4 of the American League Division Series as the Yankees face elimination by the Detroit Tigers, who have a 2-1 series lead. Not exactly the guy that Yankee fans (like myself) would preferably like to have their season rest on. Can he keep the Yankees' quest for a 28th World Series title alive? If you have watched Burnett over the years, you know how incredibly erratic he can be. He has the stuff to be lights-out and when he's on, he's on. But way too often he is not often and gets slammed. This is the time that the Yankees need Burnett to be on or else the season is over. Quite frankly, the confidence level in Burnett is pretty low amongst Yankee fans. Some are calling the season already over. But this is why we play the game. And hey, maybe Burnett will be on tonight and pitch a gem. That would make for a great movie. And what should give the Yankees some more hope is the fact that they are facing Rick Porcello. Porcello did pitch pretty well down the stretch but he has been very inconsistent all season. If the heart of the New York order can actually perform, this is a guy they could tee off on. Would I bet on the Yankees tonight? Honestly I wouldn't but we seen many crazy things happen in the world of baseball over the last month so anything is possible.